If you are one of many passengers who have experienced outage on wireless services on a United Airlines flight, then you’re in for some dough! 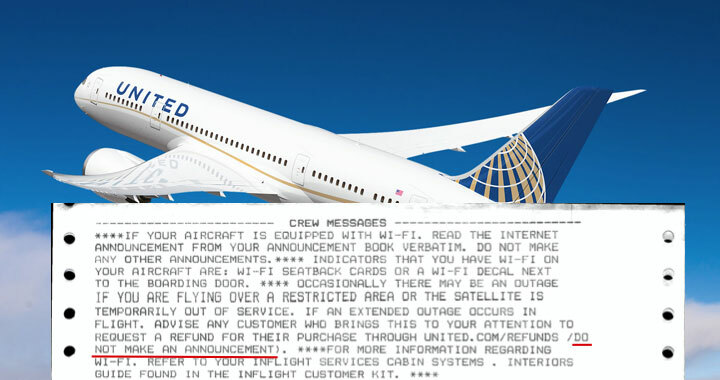 The people at Untied.com (which is not United.com, but a website maintained by critics of the airline) has come across an internal document instructing crew members to tell passengers, who complain on an individual basis, that they should ask for a refund if their wireless service is not able to connect. If an extended outage occurs in flight, advise any customer who brings this to your attention to request a refund for their purchase through United.com/refunds. Do not make an announcement. This simply means that if there’s a plane-wide outage then you’d never know and wonder if it’s your computer or tablet that is acting weird. In explaining this to LA Times, United didn’t think they are cheating the passengers, because not everyone on a plane has purchased wi-fi so why make a planewide announcement? Which makes sense because you can still go to the carrier’s website to request a refund. So make sure you always ask for a refund, or at least let your co-passenger know about it.